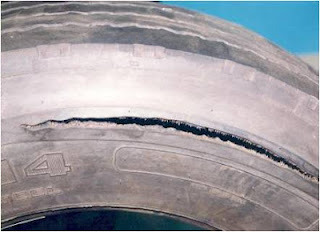 In the previous post I covered Run Low Flex Failure, RLOF, and how there were telltale sign or physical evidence that while each taken individually are just circumstantial in nature but when take an a whole make a very strong case for the tire having been operated for a number of miles at very significant air loss. In this post I want to walk you through the thought process of a forensic analysis of the evidence that is available and show how an opinion or conclusion is reached. First I need to tell you that I have not had the opportunity to personally inspect the subject tire, but there is a YouTube video and I will show you some shots from the video and tell you what I see in these shots. Second I cannot tell you about the individual as I have had only limited correspondence about this tire failure but according to statements in the video they called it a "Blowout", said they had checked the air pressure in the morning and had only driven about 45 miles before the loss of air occurred. So lets see what the pictures show. I have highlighted the area of interest in each picture. 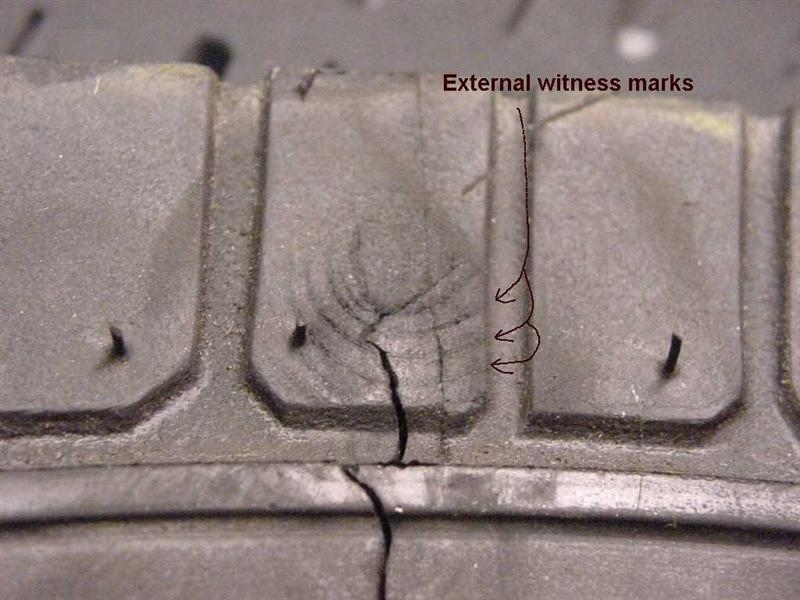 In pic #112 we see in the yellow area signs that the interior of the tire was worn from abrasion on the inside of the tire under one side of the tread rubbing on the inside of the tire above the wheel. This occurs at 0 psi but takes more than the half mile it takes to come to a stop to wear this much. 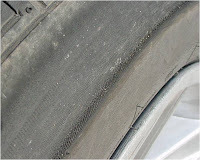 Also the tire must still be in one piece such that the tread can uniformly contact the lower interior of the tire so the wear occurred before the tread part of this tire broke away. 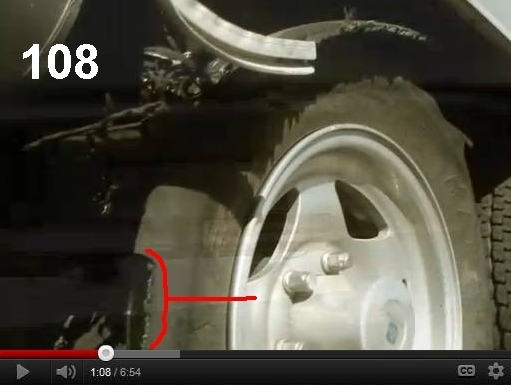 In the red area we can see a few dark holes where the body cord has melted and shrunk back into the tire structure. This occurs when the body cord exceeds 390°F. To put this temp in perspective properly loaded and inflated tires may get to 160°F and ultra high speed tires such as seen at the Indianapolis 500 may see 200° to 210° but rubber starts to come apart an just a little more than that. In pic 108 is another view of the same location of melted body cord. If the cord had simply failed due to high pressure the cord would be frayed. Also note the nice circumferential line the failure took. More on that later. Moving on to pic 057 note the areas circled in red. An alternate view is seen at the arrow in pic 426. Now if we compare the loss of the ridge that is easily seen in pic 121. 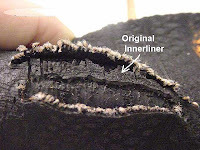 What this means is that the upper sidewall was in contact with the road surface for a number of miles and the outer edge of the sidewall "Scuff Guard" raised rib has been completely worn down. What we do not see is the lettering of the "Scuff Guard" worn away so we know that the wear was not due to the trailer being repeatedly parked against a curb. Now I am sure some are wondering how I can tell the difference between running a tire at 5 psi vs 0 psi. Well here are some shots from an experiment I ran myself a few years ago. The next picture is of the interior of the same tire. You can see the nice circumferential crease/crack that has formed. This tire did not generate enough heat to melt the body cord as I was driving at less than 10 mph for the 3.9 mile test. That crease is at the location up the sidewall similar to where we see the circumferential failure in the "Blowout". Note there is no contact between the inside of the tread and the inside of the tire above the wheel as seen in the RV tire. If you look at some of the examples shown in the previous post you will note that many show the same nice circumferential failuer line. 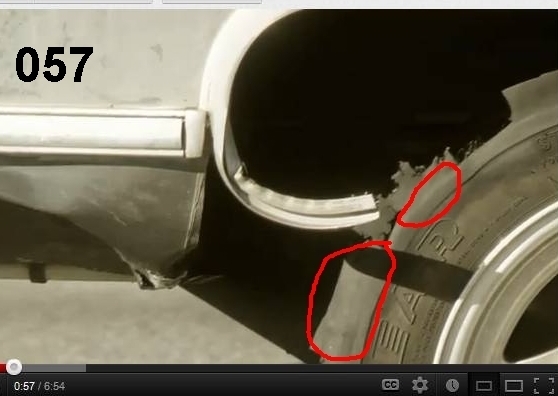 Here are some examples that I use as ref pictures to help me understand the Root Cause of a tire failure. Here are pictures of melted body cord, broken body cord and the holes sometimes left when the cord heats up and shrinks as it melts. I hope this helps you see how easy it is to be mistaken when you think the failure is because of a defective tire when in fact the evidence shows the tire lost ari, the Rv continued down the road at normal highway speed and after a few miles the tire "blew out". The only way to have some warning and to protect yourself against this all too often type of failure is to have a TPMS which will warn you as soon as the tire looses 10% of its air. Bottom Line: I do not think this tire was "possibly defective" or a "crap tire". It did not "fall apart for no apparent reason". It came apart because it lost its air and the operator did not know till too late. 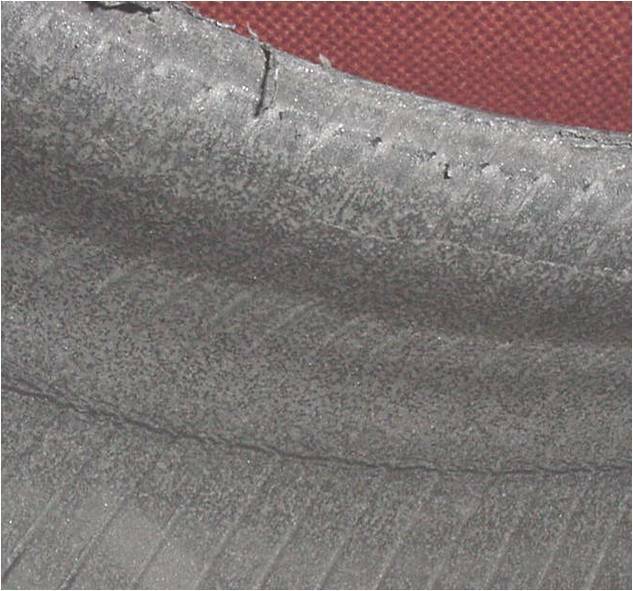 Many people make statements about a tire "blowing out" or being defective but few post any facts about the real condition of the tire other than it came apart. There is a major difference between simply reporting a condition and providing information on the "Root Cause". 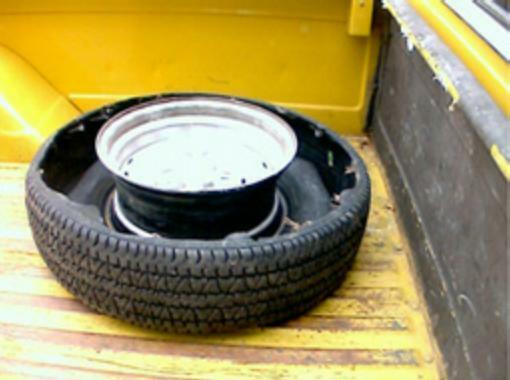 Examples of Conditions would be "the tread came off' or "tire lost air" or "tire went BOOM". 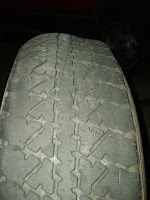 Examples of Root Cause might be "tire had a puncture" or "tire had an impact break" or "tire was run low and the sidewall had a flex failure". If you don't know the "WHY" of a tire failure then whatever actions were taken after the failure may or may not help to prevent a re-occurrence. To help you understand this concept I want to take you through some real life examples. 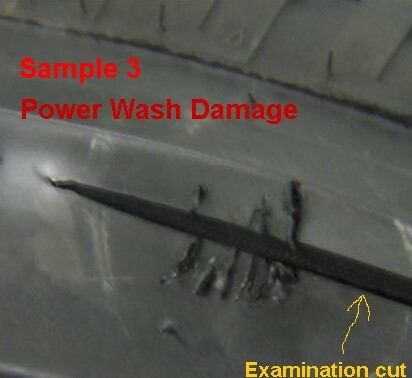 In many of these examples it was initially claimed that the subject tire was simply "defective" however as we review these examples I think you will ultimately agree that most tire failures occur because of some outside cause. 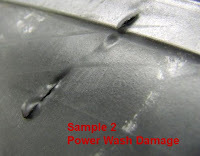 Here are three examples of damage done through the use of a high pressure power washer. In each case someone claimed there was a defect built into the tire that caused a blister to form as seen in the pictures. 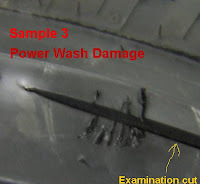 I know and proved that the damage was in fact caused by the use of a power washer as I did a quick cut tire examination (autopsy) to examine the layers of the sidewall. No internal contamination was observed. A theory was formed and an experiment done to confirm or refute the theory. 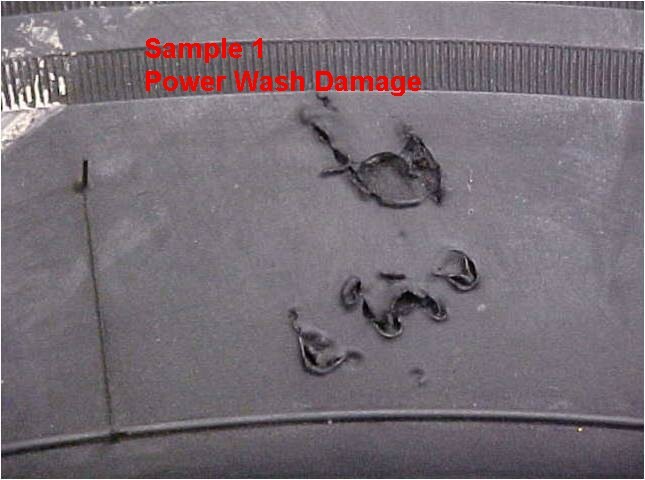 A tire that was sound was selected and using a pressure washer similar to what any of us could buy at a big box hardware store, we were was able to duplicate this damage. Sidewall Impact Breaks occur under a combination of variables that have a very complex interaction. These include speed, load, inflation, shape and size of the item impacting the tire, angle of impact and even the condition of the shock absorbers. Change one or more of these and you may avoid the damage. What usually happens is the pot hole or road debris is hit but if the tire doesn't immediately fail the incident is forgotten. Miles later the now damaged and weakened sidewall ruptures with no advance warning. Even if you have a TPMS you will probably get only a few seconds advance warning as the now hot rubber will rupture very quickly and the tire will many times shred which destroys the evidence. 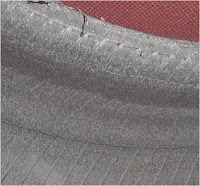 Sometimes the sidewall bulge is observed before the sidewall ruptures. The inspection of tires with this body ply damage allows us to identify the sequense of events. 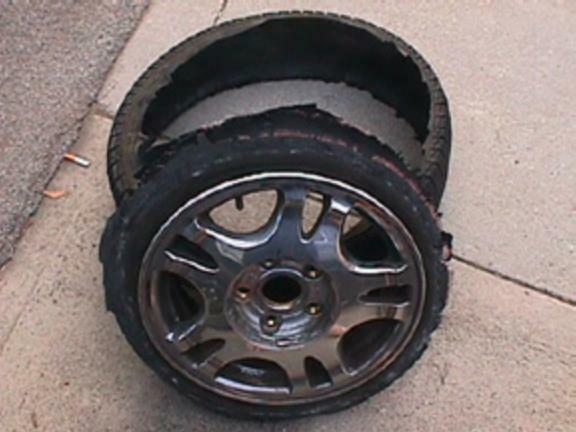 In fact if you attend one of my tire seminars I relate the story of my then fiance and her experience of traveling over 17 miles after the impact before the tire ruptured.